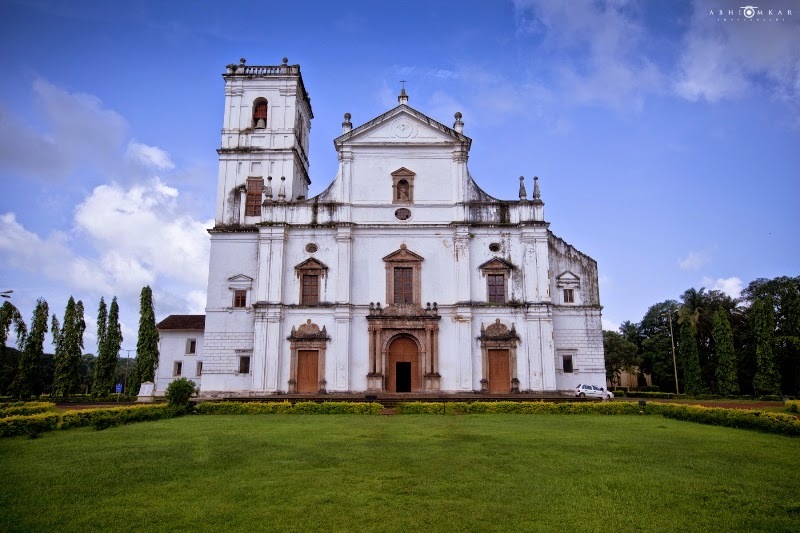 One of the main heritage signs that Portuguese left behind in Goa are the majestic churches. They are not just the places of worship; they are significant icons of Goan culture and architecture. 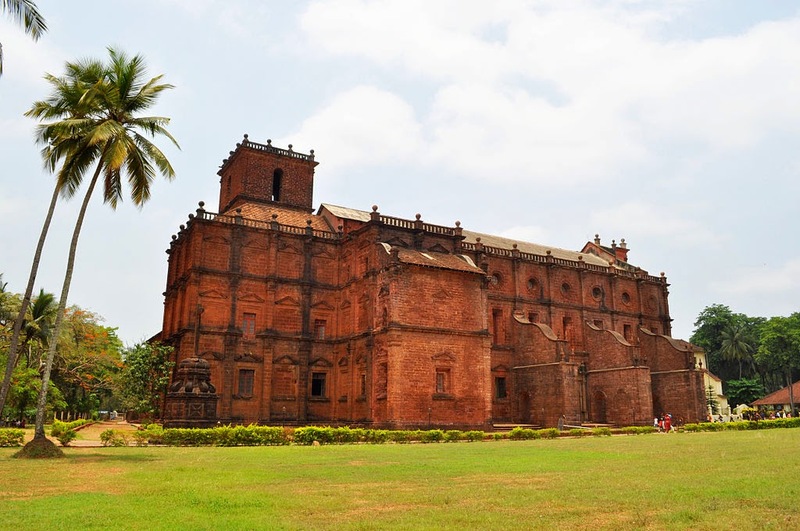 Most of the Goan churches are made in the Baroque architecture style and the most famous among them is the "Basilica of Bom Jesus" in old Goa. The 400 years old magnificent basilica is one of the world heritage centers chosen by UNESCO. It houses the mortal remains of St. Francis Xavier, the founder of Jesuit congregation. The Basilica is very vast with multiple altars and huge columns rising up till the ceiling. This Portuguese architecture marvel standing tall against the test of time is a never-miss destination in Goa. Its exposed brick red exteriors with huge front façade add to its ancient charm. The basilica was once covered in white plaster as many other churches in Goa. However in 1950, the white plaster was removed to retain the authentic look of the Basilica. The interior of Basilica is kept simple except the grand golden altar creating a perfect contrast. On a closer look, the altar reveals many intricate sculptures and delicate floral patterns which is a specialty of the Baroque architecture. One can spent hours just looking at the marvelous altar. The Bom Jesus Basilica is a huge church with a beautiful central courtyard. It houses a typical Portuguese style fountain in the middle. Across the road, around half a kilometer from the Basilica of Bom Jesus, “Sé Catedral de Santa Catarina” Also known as the “Sé Cathedral” is situated. Sé Cathedral is the largest church in India. The construction of Sé Cathedral started in the year 1510. It originally had two towers on the either side. The one in right side collapsed in the year 1776 and was never rebuilt. This is visible from the front view of the Sé Cathedral. It has white plastered interiors and the floor is tiled with stone. It has multiple altars on the sides of the main Altar dedicated to Catherine of Alexandria. Next to the “Se Cathedral” there is a small chapel situated in a beautiful garden. It is known as the Chapel of St. Catherin. This humble chapel has a great history behind it. It was the first religious structure built in old Goa in the year 1510 by Alfonso De Albuquerque to mark his entry into the old Goa city, defeating the Adil Shahi ruler of the old Goa. It is very easy to miss this small chapel but there is a unique charm to this place. The chapel is well maintained, but not used for religious purpose. As it is not visited by many tourists, there is always a silence clinging to this place. It’s indeed quite disturbing to just look at the abandoned brick red altar. Every time I enter this chapel I spend few moments in silence. I think of the thousands of men died in the war which lead to the construction of this chapel. Peace is always a costly reward of the war! Another church which is a must see is the “Our Lady of the Immaculate Conception Church”. 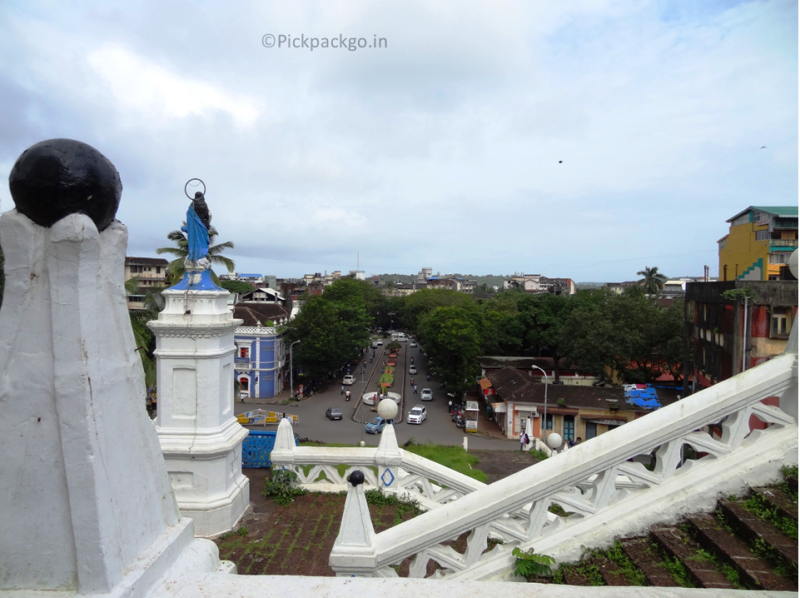 It was built in the year of 1540 and stands right in the middle of the Panjim city. Its pure white color, the crisscross stairs and the bell tower on the top makes this church quite picturesque. It is a famous icon of Goa, which has made appearance in many movies including the famous “Josh”. The interior of the church is simple, but its view from the road below is quite mesmerizing. It also offers a nice view of one of the plush promenades of Panjim city. Wow, beautiful photos! I'm ashamed to admit that I was in Goa for a week but never went into the colonial centre, let alone in a church... I was at the beach but the main problem was that it was the rainy season & it poured every time I went to leave the hotel... thanks for showing me what I missed out on, I will have to go back! Wow, stunning. Love the Baroque architecture style. I love visiting churches and cathedrals, and religious sites while we're abroad - they are always the most fascinating, stunning and interesting buildings, with the most amazing history to them. Whether you're religious or not. I love churches from a historical point of view, and the silence around small chapels always calms me down. There were times I just sat and worked in such a chapel, it was better than a library! A visit to Goa rejoices and pumps new energy from your hectic schedule. The amazing beaches, water sports, adventure activities, cuisine are considered as limelight of Goa. However, that’s not everything; grandeur of Goa is the architectural symphony that can be found on various convents and churches. The beauty of Goa is doubled by presence of numerous ancient master pieces displayed on churches. Interesting, You conetnt is really good.